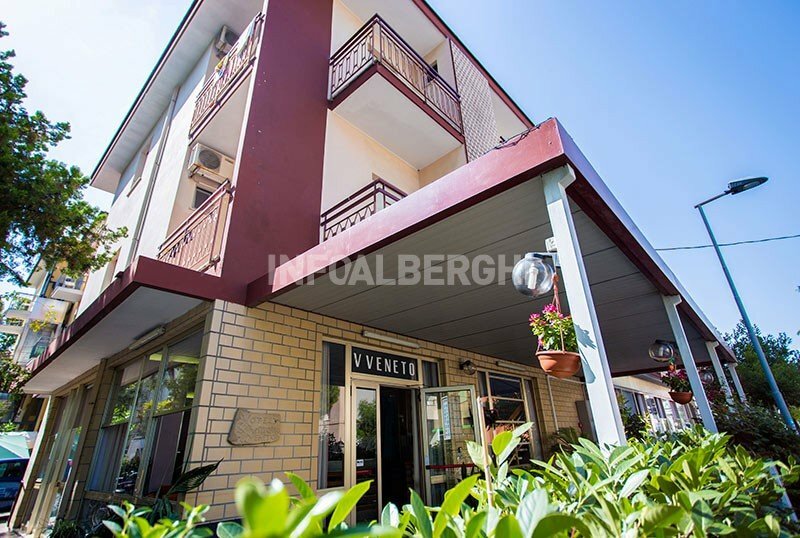 Hotel Vittorio Veneto is a 2-star hotel in Rimini located a couple of minutes walk from the beach, in a quiet area not far from the center. Offers free WI-FI, air conditioning and private parking (subject to availability). Pets of all sizes are allowed (even on the beah affiliated with the hotel). The hotel is located in Marina Centro, central area of Rimini, near the sea, in a shady street with little traffic. The location is close to the promenade and the beach, which can be reached in a couple of minutes on foot. Marina Centro is well connected to the station and to the historic center of Rimini as well as to Riccione by bus n. 11. All rooms have a balcony, digital TV, safe, air conditioning, ceiling fan, private bathroom with shower and hairdryer. FAMILY : for large families there are communicating and family rooms available. Open-air porch equipped with chairs and tables, free use of bicycles, lounge bar and TV room. PARKING : uncovered and available subject to availability. AIR CONDITIONING : available in room with supplement. BREAKFAST : buffet with sweet and savory products. LUNCH AND DINNER : double menu based on local cuisine with meat and fish dishes every day, always followed by a buffet of vegetables and side dishes. VARIATIONS : the staff prepares gluten-free dishes for coeliacs. At meals : seats at the table and baby food. The hotel has an agreement with the Bath 81-82 "No problem" with Dog Beach equipped and facilities for the disabled, entertainment, services for children (large playground, baby sitter, microwave for baby food and baby bottles and baby changing room with changing table, baby toilet) and area suitable for dogs. The list prices are per day per person for a minimum stay. 3 days. ALL INCLUSIVE: Full board + Water with meals + Beach service.